I'm going to share with you something - Faux painting doesn't have to be difficult. However, it is important to follow through on certain procedures, often overlooked by even professional faux painters. With this video, I will explain these points and difference they will make! This is also a unique instructional video in that we begin with a blank canvas tour of an actual home. From there, you watch step-by-step and learn how-to transform different rooms by faux painting! 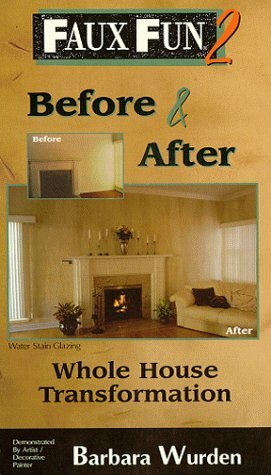 I will show you unique paint techniques for different living spaces and after we complete each room, I will show you before and after photos that reveal the beautiful transformation you can do on walls and furniture by Faux Fun painting! If you have any questions about this product by Faux Fun, contact us by completing and submitting the form below. If you are looking for a specif part number, please include it with your message.